The Wisconsin Senate narrowly approved a “right-to-work” bill on Wednesday that would bar private-sector employees who work under union-negotiated contracts from being required to join their unions or pay them dues. The bill, which would make Wisconsin the 25th U.S. state with a right-to-work law on the books, cleared the Republican-led Senate on a 17-15 vote following hours of debate marked by periodic angry shouts from opponents in the Senate gallery. Supporters of organized labor chanted “Shame!” as the legislation was passed and sent for further consideration to the state Assembly, where Republicans also hold a majority. One Republican senator, Jerry Petrowski, broke with his party and joined all 14 Democrats in the chamber in voting against the measure. Wisconsin Governor Scott Walker, a possible Republican presidential hopeful, is expected to sign the bill if it reaches his desk. Walker drew accolades from conservatives across the nation in 2011 when he ushered through legislation curtailing the powers of most public-sector unions in Wisconsin amid large protests at the state capitol in Madison. Supporters of the right-to-work measure contend it could attract more businesses to the Midwestern state. “I think this is something that is going to have a direct impact on the manufacturing sector in Wisconsin,” Senate Republican leader Scott Fitzgerald said after the vote. Opponents cast the bill as an assault on organized labor and blue-collar workers that would limit union revenues. “They are evaporating the middle class, and no one in this room seems to care,” Senator Dave Hansen, a Democrat, said during the floor debate. So ignore the rather clearly biased language in the piece and video linked above, if you bother clicking through and reading it… If you’ve seen one piece about the subject, you’ve pretty much seen them all, and this one is no different. Wisconsin is debating “Right to Work” legislation in house committee right now, after passing in the senate. A right to work measure (which may or may not be substantially identical to the one passed by the senate) is likely to pass the house as well, and governor (and likely Republican presidential candidate) Scott Walker is likely to sign it. Can someone tell me how making it illegal to force someone who doesn’t want to join a union, to join a union… is anti-union? That’s all “right to work” means… You can’t be forced to join a union if you don’t want to, and employers can’t be forced by the government to recognize or deal with a particular union if they don’t want to. The “right to work”, is simply the right to freely associate and form contracts as we choose, which is supposed to be a right guaranteed us in this country (of course, so often it is not… but that’s another issue entirely). Wait… What? Unions can force people to join who don’t want to? Yes, they can, and they do. Most people don’t know this, but in 26 states, unions are given special powers and privileges by the government, which you as in individual, or a private company or other organization would not have. One of these, is that you can be forced to join a union against your will, if you want to get a job in a particular industry, or at a particular employer, or to keep your job at an employer after a union comes in. Worse, in some states, you can opt out of the union, but even if you do, the union can still take dues straight out of your paycheck against your will, as if you were a member. They can also negotiate for you against your will, and set the terms and conditions under which you work, against your will. Of course, since you aren’t a member, even though they’re taking your money and controlling your job, you don’t get to vote in the union, control its decisions in any way, or get any of the benefits of membership. The union gets your money, and all the benefit as if you were a member, without actually having to be accountable to you at all. And there’s nothing you can do or say about it. Oh and the union can then do things like use that money to get politicians you oppose elected, get legislation you oppose passed, and change the terms and conditions of your employment against your will, without your approval or consent. In those same 26 states (as well as federally in some cases), employers can be forced to recognize and negotiate with a union, even if they don’t want to. In fact, even if the union doesn’t actually represent their employees in some cases, or only 50.01% of their employees decide that a particular union will represent them. “Right to Work”, is about ending some of those, frankly insane, conditions that unions operate under. In “right to work” states, unions are still free to form, recruit members, and to collectively bargain in those members interests with employers. Workers are still free to join unions. Employers are still free to negotiate terms and contracts with the union, and if the employers don’t want to negotiate, unions are still free to use the power of their membership to make the employer negotiate through strikes, work stoppages and slow downs, and other organized labor actions. The only difference, is that the union just can’t FORCE anyone to join the union, or force employers to negotiate with the union, or get the government to do it for them. It isn’t. Straight up, it isn’t. It’s not bad for employees, it’s not bad for employers, it’s not actually bad for the unions if the unions are doing what they’re supposed to be doing, It’s not bad for consumers who consume the goods and services these employers provide. This doesn’t always work out… It has generally done so in relatively business friendly states like Tennessee, North and South Carolina, Georgia, Alabama (I said relatively… relative to Illinois, New York, Wisconsin etc..). In those states, which are right to work, non union manufacturing has generally done well, in some cases even boomed. Not only that, but wages have substantially increased in those areas, not crashed as predicted by unions. Right to work has not had as positive an impact in say, Indiana, or Michigan (yes, Michigan has been right to work since 2012… and yes, organized labor is still having a collective fit over that fact), which are comparatively less business friendly, higher tax, higher regulatory burden, and higher cost of living. In fact, mostly, companies have used the change in status to help them get rid of legacy contracts which were burdening their bottom lines, and then move to other states. That however isn’t really the fault of right to work… it’s the decades of anti-business regulation and being forced to accept bad union contracts (and to be fair, decades of bad management as well). Overall, right to work in and of itself is not a negative for anyone… well… except two groups. The only parties it’s bad for, are union officials, and the politicians they’re in bed with). The officials depend on the politicians to pass legislation that favors the union officials, in exchange the politicians depend on the officials for large donations, and the use of their organization for street level politics (campaign volunteers, donor lists, call lists, phone rooms, rally fillers, doorbell ringers etc…). Without the forced membership and dues, the union officials don’t have as much money to donate to those politicians in exchange for favors, nor as many warm bodies to throw at their campaigns. Also, if people can leave the union at will, it means that those officials have to watch their steps, and actually be accountable to union members…. Unfortunately something which has proven to rarely be the case today. Does “right to work” reduce unions power? Potentially yes, if people don’t want to join, or want to quit the union. However, I don’t see that as a bad thing. Why would that be a bad thing? If people don’t want to be members of the union, why should the union get more power? Or any power at all? Shouldn’t a union get it’s power from the strength of it’s membership, who support it, and in turn are supported by it? Shouldn’t a union attract and retain members because they are effective at doing so? If they can’t do that… why should the union exist at all? If they CAN do that, then why do they need the government to force people to join, and force companies to negotiate with them exclusively? If the unions actually do what they’re supposed to do, and what they say they do… Why is this even an issue? …I would still be in favor of right to work. I generally favor right to work, because I’m in favor of fundamental individual rights, including, but definitely not limited to: freedom of conscience, freedom of association, freedom of self determination, the right to private property, the right to the fruits of ones labors, and the freedom to make contract as one sees fit. I generally support right to work legislation, presuming that’s what it really is (as with all legislation, what it claims to be, is often nothing to do with what it is, so pay attention to the details), because no-one should be forced to join any organization against their will (even if it’s absolutely for their own good), and no organization should have the right to control others in the way unions do, without those persons consent (even if doing so is to those persons benefit). It really is that simple. For that matter, in general, I oppose involuntary collectivism, and preventing involuntary collectivism is what “right to work” is supposed to be about. I’m all for voluntary collectivism… absolutely 100%. If you agree and consent to be a part of a group, and to take action as part of that group, or be represented by that group, great. More power to you, and to them. In fact, I’m all for unions. I think collective bargaining is a wonderful and powerful tool, and I wish more people across more industries and market segments would take advantage of it. An aside… I’m not just blowing theoretical smoke here. I’ve got a personal stake in this, both as a matter of principal, and as a practical matter in my own profession. The level of worker exploitation, and in general negative, harmful, and just plain stupid labor practices in information technology, my chosen profession, is absolutely despicable. Employers routinely extract far more labor from employees than they are paying for, or than that is reasonable for employees quality of life or professional development; while at the same time deliberately suppressing those employees wages, and denying them opportunities for improvement or advancement. … and we allow them to do this. We accept it, because we don’t believe we have the power to change it, or we feel too insecure to do so. The only way these conditions are going to change, is if they obviously and clearly no longer work to increase profits or improve stock prices. That being the case, the only way needed change is going to happen, is if enough of us in the profession stop accepting these conditions, and do something about them. A company can’t be pumping its stock prices, if it doesn’t have anyone keeping it’s computers and networks operational…. or at least not for more than a few weeks. Stop working for companies that use these practices. Insist on being paid for our time. or in receiving compensatory time off. Report companies for labor law violations, and make sure the laws are properly and evenly applied, through the use of the media and political pressure (I think most labor laws are horrible and stupid and shouldn’t exist, but so long as they do, the greater tyranny is that they are applied capriciously and unevenly based on political whim, and lobbying). Most importantly, as managers, leaders, and thought leaders in the industry, don’t allow and accept these practices in your own organization. When they pop up… and they will.. gather together, and pound them into the dust before they can take over. One of the more effective ways we could do all of that, is with collective bargaining, and collective and consistent messaging to the media, and politicians (though sadly, I don’t think it’s likely to happen any time soon). Not necessarily a union, but some type of voluntary collective organization to increase our negotiation power and leverage, and help to prevent things like companies requiring hundreds of hours of uncompensated overtime. If enough of us act… whether collectively or as individuals, we can force changes. Without enough of us acting in concert, we can’t… And if we can’t, we’re left depending on the government to “fix” things… and you know how I feel about that. It’s when you take that choice away by force, that I have issues. Forced unionization is never OK… and that includes “democratic” forced unionization. Just because you got a few dozen of your friends together and you all voted to give you the “right” to control everyone else, doesn’t actually give you the right to control everyone else. Even if there’s 50 million of you, and 1 of everyone else. Otherwise, there are no individual rights, only privileges and entitlements dispensed by the will of the majority. That’s no less tyranny than a dictatorship of one man… and in some ways is a greater one. Right… because giving more control over your life to everyone else is always a great idea, especially when jobs and money are at stake. And people like this idea why? No thanks. Not up for that. 4. The union cannot set the wages, benefits, conditions and terms of employment, and working conditions; for individuals or employers, without their consent. If they’ve got consent for collective representation of all the workers, and the employer agrees to the conditions and terms… GREAT. That’s what collective bargaining is for. Otherwise, what gives you or anyone else, the right to determine those things for me, my employer, or anyone else? Just because you and your friends voted on it? Stop using “net neutrality” to refer to government regulation of the internet. That’s not what net neutrality is, and it’s certainly not what the government regulations promulgated by the FCC today are, in this case “Common Carrier” Rules. People who don’t know any better are celebrating todays faux “net neutrality” FCC action as a victory for freedom and free speech on the internet, when in fact, it’s exactly the opposite. I’ve written extensively about net neutrality and this is very much NOT it. All the FCC has done today, is impose common carrier regulation on every ISP (oh and by the way, lots of other organizations as well who “provide internet access”. No-one has any idea how the regulations are going to be finalized, what the language will mean, who will be impacted and how… except everyone knows it’s going to cost a lot), instead of just the telephone companies it was already imposed on. Verizon for example, who was already one of the worst violators of net neutrality, even with common carrier regulation already in place for them. Thus it makes competition and breaking of existing monopolies even harder, while not actually doing a damn thing to secure or improve neutrality… oh and it gives the FCC more control over the internet. Absolutely none of those are good things. Common carrier regulation is a big part of what made the current near monopolies on Internet access happen in the first place, because small independent companies, and even large regionals, couldn’t compete with the giant telcom conglomerates under those regulations. So, they all got swallowed up. 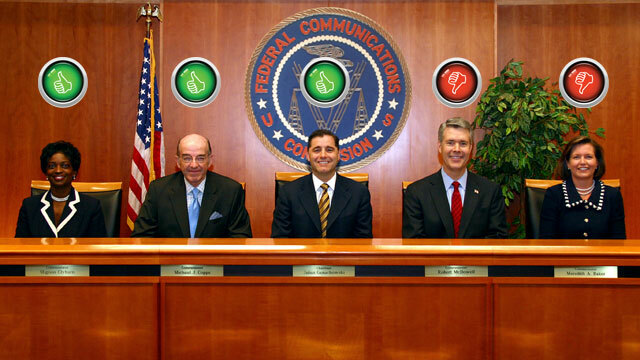 I’ve been working with telecommunications companies, and common carrier regulations, for more than 20 years. I’m an expert in governance and regulatory compliance, and I can tell you right now, NOBODY understands these regulations, because they are not capable of being understood. I’ve flowcharted them before to try to see what applied how and where and when… the only thing I could come up with was “nobody knows for sure, it all depends what a regulator or judge says at the time”. This wasn’t a blow for freedom and free speech… This was a giveaway to big corporate donors in the telecommunications industry. The big telcos have been trying to get their primary competition, non-telco ISPs, burdened with the same regulatory load they labor under, for DECADES. Now, in one stroke, the FCC at the personal direction of the president, has given it to them. Oh and guess what else common carrier regulation includes… SURVEILLANCE. All common carriers are required to provide the government and law enforcement “reasonable access” for surveillance, as well as to give up records, usage details, and other subscriber and user data, WITHOUT A WARRANT. What does “reasonable access” mean? Whatever the government says it means… and if you think I’m exaggerating, I’m not. I’ve dealt with the FBI on this issue, and that’s a direct quote. Yes, this is not only a massive corporate crony handout, it’s also a huge gimme to the FBI and the NSA, who have wanted all ISPs stuck under common carrier for years as well. Stop calling government regulation of the internet “net neutrality”. Letting the liars control the language helps them lie to you. Net neutrality is not government regulation, and these regulations are certainly not net neutrality, nor anything like it. Don’t be taken in by fraud, cronyism, and statism, masquerading as freedom. It’s not possible to be adequately informed on every issue and it’s refreshing to see an intelligent person with a decent sized megaphone say so. It so happens these very issues I don’t quite have a handle on either. Israel/Palestine is a much more complicated issue than most Americans understand (I don’t necessarily think Israel is always in the right and saying so doesn’t make me an anti-Semite). On Net Neutrality my instinct is just leave the internet alone; its working just fine as it is (but then again, this is just my instinct I could be wrong). Bitcoin – I like the idea and I hope it’s as good as advertised but I also worry it’s a giant “pump and dump” scam. Don’t buy more Bitcoin than you are willing to lose. While it is very important to defend the “brand” of the liberty movement, it’s also important to recognize the reasons why people believe some rather nutty things. Not everything that sounds crazy is. What exactly would “keeping up with inflation” mean? The minimum wage has been $7.25 an hour since 2009. In 1938, when the federal minimum wage was established, it was $0.25 an hour. In constant dollars (adjusted for inflation) that’s $4.19 as of 2014. So, not only has the minimum wage kept up with inflation, it’s nearly doubled it. Ok.. well what about more recently? Minimum wage 20 years ago in 1995: $4.25, or $6.59 in constant dollars. Minimum wage 25 years ago in 1990: $3.80, or $6.87 in constant dollars. Minimum wage 30 years ago in 1985: $3.30, or $7.25 in constant dollars. Funny… that’s exactly what it is today… How shocking. So, for 30 years, the minimum wage has not only kept up with inflation, for most of that time it’s been ahead of it. So, how are they lying? The way “progressives” claim minimum wage hasn’t been “keeping up with inflation”, is by comparing today, with the highest level it has ever been; almost 50 years ago, in 1968, when the minimum wage went to $1.60 an hour ($10.86 in constant dollars). This was a statistical anomaly. There’s a long and loathsome tradition of lying with statistical anomalies. In constant dollar terms, the minimum wage today, is about the same as it was in 1962 (and as I showed above, 1985). It just so happens that from 1948 to 1968 we had the single largest wealth expansion over 20 years, seen in the history of the nation (about 5-8% annual growth)… Which then crashed hard starting at the end of ’68. From 1968 to 1984, the U.S. had 16 years of the worst inflation we ever saw, and the purchasing power of ALL wages fell significantly, as wages failed to come even close to keeping up with inflation (we saw 13.5% inflation in 1980 alone, which is about what we see every 4 years today). It took until 1988 for real wages to climb back to their 1968 constant dollar level, because we were in a 20 year long inflationary recession, complicated by two oil shocks and a stock market crash (actually a couple, but ’87 was the biggest one since ’29). Of course, income was on a massive upswing from 1948 to 1968 (and in fact had been on a massive upswing overall since 1896 with the exception of 1929 through 1936). In 1941 household income was about $1500 ($24,000 constant), in 1948 $3,800 ($37,000 constant). Like I said, it was the single greatest expansion in real income and wealth over a 20 year period, in American history. 1968 was a ridiculous historical anomaly… Not a baseline expectation. So, From 1964 to 1984, the minimum wage was jacked artificially high (proportionally far above median wage levels), and “progressives” chose to cherry pick the absolute peak in 1968 from that part of the dataset, in order to sell the lie. As to the minimum wage not being a living wage… No, of course its not. It never was, its not supposed to be, and it never should be. The minimum wage is intended to be for part time, seasonal workers, entry level workers, and working students. Only about 4% of all workers earn the minimum wage, and less than 2% of full time workers earn the minimum wage. Minimum wage is what you pay people whose labor isn’t worth more than that. Otherwise everyone would make minimum wage. But since 98% of full time workers can get more than minimum wage, they do so. What should the minimum wage be? Wait, won’t everyone become poor suddenly? No, of course not. Literally 98% of full time workers already get more than minimum wage. If we abolished the minimum wage, most of them wouldn’t suddenly be paid nothing. Wages should be whatever someone is willing to work for. If you’re willing to work for $1, and someone else isn’t, you get the job. On the other hand, if an employer is offering $10 and no-one is willing to take the job for that, they need to offer $11, or $12, or whatever minimum wage someone is willing to take. If you don’t want to work for $7.25 an hour, don’t take the job. If nobody offers you more than that, too bad, but that’s all your labor is worth. If you are willing to work for someone for $7.00, and they’re willing to pay you $7.00, what right does some “progressive” have to tell either of you, that you can’t work for that much? No-one is “exploiting the workers”, if those workers took the jobs voluntarily, and show up for work voluntarily… If all you can find is a job for less than what you want to work for, you’re not being exploited, THAT’S ALL YOUR LABOR IS WORTH TO THOSE EMPLOYERS. You may think your labor worth more, but things aren’t worth what you want them to be worth, they’re only worth what someone else is willing to pay for them. All that said, I don’t think we’ll be able to eliminate the minimum wage any time soon. So, to those “progressives” who would say “let’s make the minimum wage keep up with inflation”, I agree wholeheartedly… Let’s make it $4.19. Oh and if you don’t believe me on these numbers, they come from the department of labor, the department of commerce, and the census. If I’m lying to you, it’s with the governments own numbers… the same ones “progressives” are lying to you with.